Introducing the all-new new Hands-OnLine LIVE teaching format. 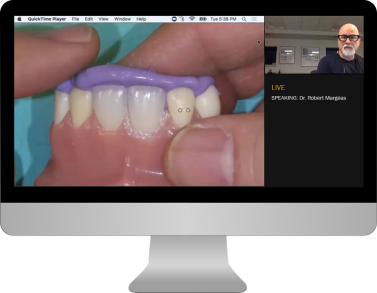 Hands-OnLine LIVE is a new, innovative method of teaching hands-on dental courses via an interactive webinar format, LIVE. After registering for a Hands-OnLine LIVE course, each participant will be sent a technique kit that includes a model, instruments, restorative materials and accessories to perform the hands-on exercise. From the comfort of your own operatory, each participant will connect to our interactive Hands-OnLine LIVE site to participate and perform the exercise. The instructor will review cases and demonstrate each step of the technique live, then allow participants to perform each step utilizing the kit provided. During the course, participants can type questions directly to the Instructor. The use of a lingual matrix to replace the lingual shelf followed by precise placement of dentin, incisal and enamel shades can yield consistent and accurate results. In this course, Dr Margeas will review many Class IV cases then perform each step of his technique, live via an interactive webinar format. Participants will then perform Dr Margeas’ Class IV case simultaneously in the comfort of their own office, LIVE. Dr. Margeas graduated from the University of Iowa College of Dentistry in 1986 and completed his AEGD residency the following year. He is currently an adjunct professor in the department of Operative Dentistry at the University of Iowa. He is Board Certified by the American Board of Operative Dentistry. He is a Diplomate of the American Board of Aesthetic Dentistry, a Fellow of the Academy of General Dentistry, American Society for Dental Aesthetics and International Team of Oral implantologists (ITI). He has written numerous articles on esthetic and implant dentistry, and lectures and presents hands-on courses nationally and internationally on those subjects. He is currently the Editor in Chief of Inside Dentistry, on the Editorial Board of Compendium, and is a contributing editor to Oral Health in Canada. His memberships include OKU Honor Dental Society, American Academy of Esthetic Dentistry, and the American Academy of Restorative Dentistry. Dr. Margeas maintains a full-time private practice focusing on comprehensive restorative and implant dentistry in Des Moines, Iowa. Class registration closes one week before the class date. Register early; class sizes are limited. Send the Hands-OnLine LIVE team your questions using this form. Call 1-800-265-3444 ext. 237 for registration troubleshooting. The federal government imposes certain restrictions on, and pursuant to the Sunshine Act requires public reporting of, transfers of value to a practitioner. Participation in this event may qualify as a reportable transfer of value under the Sunshine Act provisions of the Patient Protection and Affordable Care Act. Your Henry Schein representative can advise you of the reportable amount. Henry Schein Dental is an ADA CERP Recognized Provider. ADA CERP is a service of the American Dental Association to assist dental professionals in identifying quality providers of continuing dental education. ADA CERP does not approve or endorse individual courses or instructors, nor does it imply acceptance of credit hours by boards of dentistry. Henry Schein designates this activity for 2 credit hours of continuing education. Concerns or complaints about a CE provider may be directed to the provider or to ADA CERP at ADA.org/goto/cerp. Clinical Research Dental is an ADA CERP Recognized Provider. ADA CERP is a service of the American Dental Association to assist dental professionals in identifying quality providers of continuing dental education. ADA CERP does not approve or endorse individual courses or instructors, nor does it imply acceptance of credit hours by boards of dentistry. Clinical Research designates this activity for 2 credit hours of continuing education. Concerns or complaints about a CE provider may be directed to the provider or to ADA CERP at ADA.org/goto/cerp.